I believe NAM replaced ETA. Yes, good to see something happening over there soon after a quiet spell. Thanks for the in depth analysis - I won't elaborate further haha. I have been following the long range models from well out. I actually planned my departure based on this scenario. Hopefully it would have been worth while! Although mositure can be a concern at times, if storms rotate with impressive wind shear, I would not be surprised tornadoes can still occur. My first day last year (Easter Saturday 15th April? ), the storm was reasonably high based but still produced tornado after the 10 hour marathon for me and Ray! Of course we were dealing with impressive deep layer shear! I arrived after a relatively smooth flight on Wednesday local time:) I decided to await the Friday action. Some of you may have been following this system development on stormtrack. I chased with Tim Marshall and he targetted Seymour where the tornado occurred (I had no way of accessing high speed internet but from what I saw I believed it was a valid target). I liked the planned move as well. We were onto the storm early and it became tornado warned. There was only a narrow corridor of opportunity and the relatively short life of the tornadic supercell proves that. We followed the storm for as long as we could but the green impending hail core was not as inviting for vehicles! We ran out of road options as the hook echo swung around to our north and north - northeast! 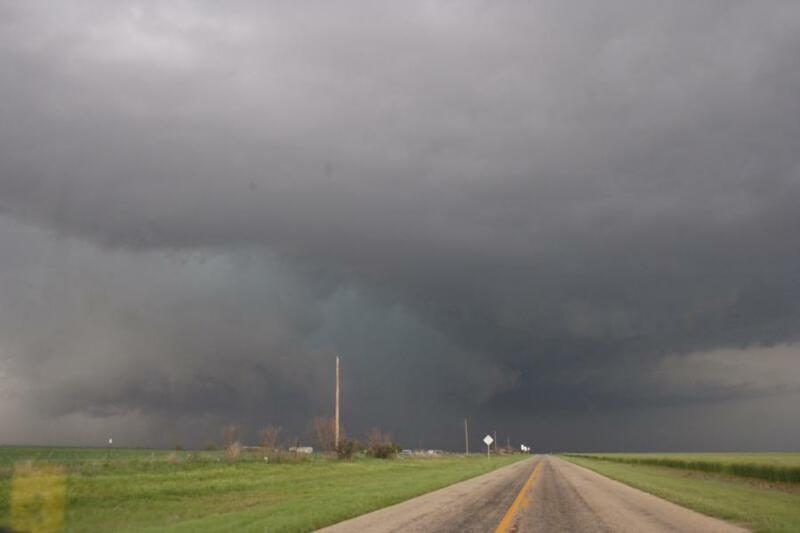 We saw what is likely one of the tornado reported as well as the developing mesocyclone being wrapped as the second wedge tornado! Anyone who got this wedge did so inside the hook! Base ball sized hail was falling at the time! Very nice indeed but you have to be the type of person who does not mind replacing windshields! Tim suggested he would rather miss a tornado even the wedge than to head on inside and get banged by hail base ball and larger! We then made our way northeast but the storm had weakened. Next we headed to route 287 back to Fort Worth. We photographed and filmed the hail to 5cm as it came across only to find that a gust front tornado had spun up 5 miles away! This killed one person unfortunately after being crushed with something heavy. So yes, we were close but unfortunately unable to intercept without being in harms way! The second tornado would have also meant that we would have had to remain in 2inch hail becoming larger - this HP supercell was dropping hail to 3 inches! The supercell was very nice and there is nice timelapse as well as images of this. I will attempt to find a way to post images at some point over the coming week! Hail west of Fort Worth falling from the second HP supercell we chased - the storm moved east and generated one or two tornadoes as well as hail to 3 inches in diameter - one person killed. Nice post macca, good stuff Jimmy. Shame you missed the wedge but it looks as though you wont have too wait too long for redemption (21st still looks the goods). I've just arrived back (in Sydney) from LA this morning and only watched this event unfold briefly via the weather channel. Yes, it was a narrow corridor of instablity and the tornadic storm motion did appear to take it north of the warm front somewhat quickly but the wind shear was great and sure worked nicely on the main cell. Were you expecting a squall line to develop so quickly ? Were we expecting a squall line to develop so quickly? I guess I have to draw upon Chuck Doswell's comments from the past; that outbreaks are difficult to predict. When I saw a linear mode evolving ahead of the dryline, I was getting worried. 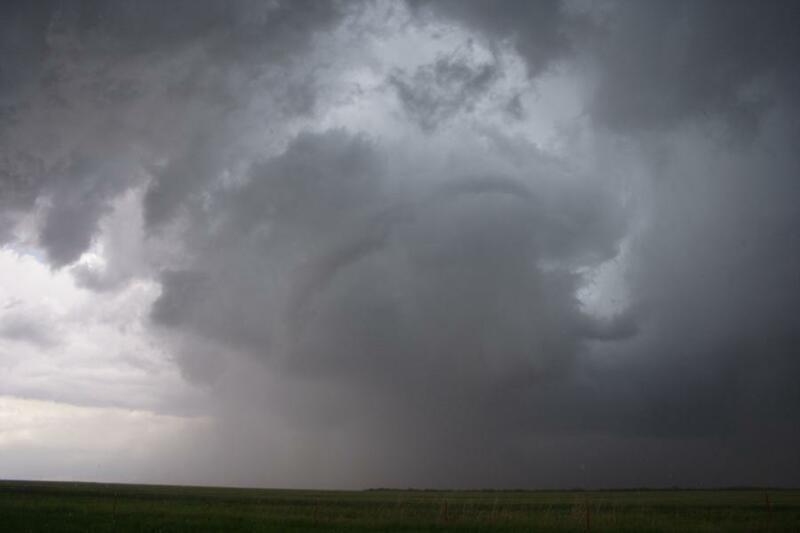 However, it remained detached and ahead of the dryline allowing this supercell to develop. The cap to the south supressed convection for long enough and for sufficient time to allow a window of opportunity (a one hour long intensity of tornadic supercell structure behaviour is short lived given the wind shear in place). The warm front not lifting far enough saved Wichita Falls from a catastrophie! There is a small chance for tornadoes today 17th April 2007 here in north central Texas so I thought I would extend the period for this thread. Although I don't like the direction of the 850hPa winds, nor the warm temperatures at the 300hPa layer though I am not going to be choosy on my annual vacation. My target is in the vicinity of 32N 98W and move east of there - 2 hour drive from Dallas. Storms move into a slightly better wind profile but cooler surface temperatures. I do agree based on the soundings that low topped supercells are in order. I'll be headed out with Tim perhaps around midday. Enjoying my time here in Texas! Hi there Jimmy, good to see you made it safely. Certainly some nice reports coming out of the US from those from the forum who are chasing. Look forward to checking each day for updates - happy chasing. We didn't end up heading out. It turns out that 5 miles from where we live there was an F0 tornado along the gust front! Goes to show just what can occur at any time here in strong wind shear scenarios and steep lapse rates. 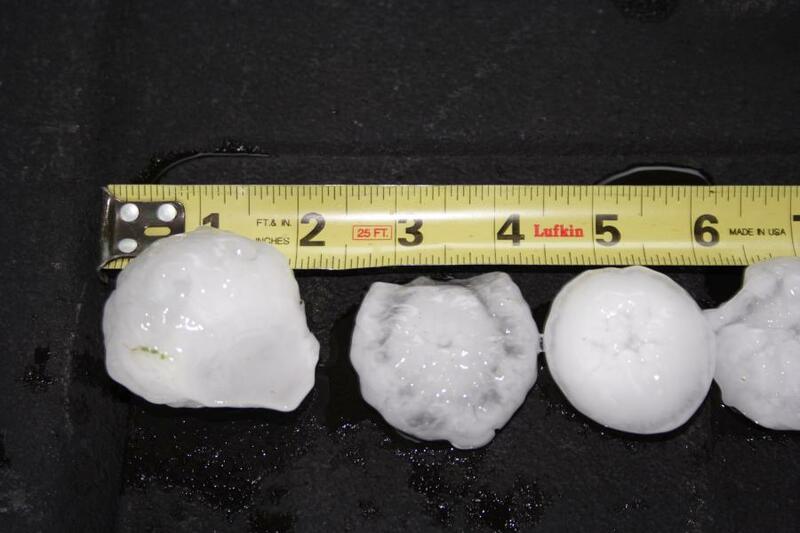 http://www.mesoscale.ws/07-documents/070414.htm aftermath of baseball sized hail Tarrant County in Dallas. Damn Jimmy, Thats 1 fat wedge tornado but amazing how tornadoes develop quickly, must be very good storm season over there.